Stephen and Bradley Hill returned to their old stomping ground. Has your junior footy club gone ‘Above and Beyond’? Stephen and Bradley Hill returned to their football roots on Tuesday night when they attended a training session at Quinns Junior Football club. 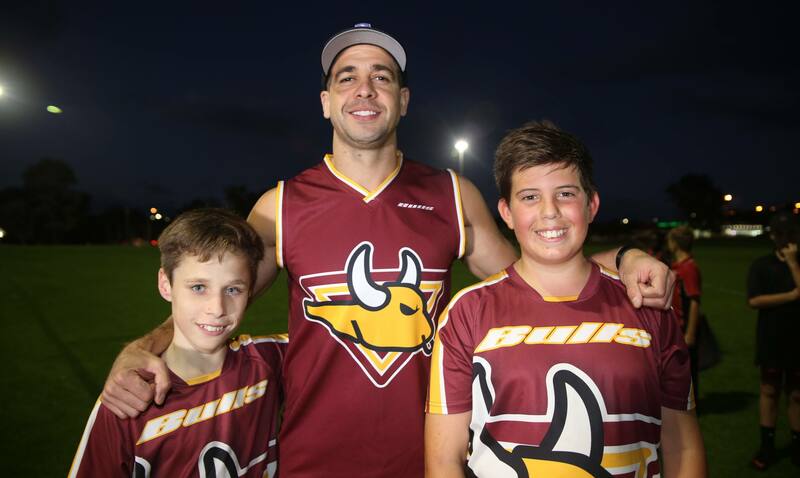 The brothers played their entire junior footy for the Bulls, while older brother Stephen has life membership and holds the club record for most games played at 167. The Hill duo joined the session at Ridgewood Park and Stephen said it was great to be back to his old stomping grounds. “It feels good being back here,” Hill said. “I started with Auskick at maybe five or six years old. Hill understands the importance of being a role model within the community. “I remember when I was a young kid, I used to look up to a lot of the AFL players,” he said. “I was always excited to meet them. “Any opportunity I got to spend with the players made my day, so I’m hoping it’s the same for them. The Fremantle playing group have been busy visiting junior football clubs and Primary schools around the Perth metropolitan area this week, teaching aspiring footballers a few of their best skills.